← Little Joe Wows MOT Crowd–Again! Some of us have argued from Day 1 that it was never workable and that there was a better chance of getting Latinos engaged on the issue if we went for broke on the issue–fighting for the best reform possible. Instead, we have theatrical gridlock, a pissed off Latino electorate, and, unfortunately, the same politicians vying for the Latino vote. Sure, the Republinuts will pounce on this as a flip-flop (I call it primary politics), but that means they’d have to defend Obama’s 2,000,000 deportations, right? No doubt, Republicans are the worse, but it’s about time Democrats were better than usual, don’t you think? It seems too many people on both sides of the aisle want to have it both and all ways. Some Dems want the Latino vote, while Republicans want a cheap Latino workforce. Either way, Latinos get kicked around and the issue gets kicked into the future, as always. 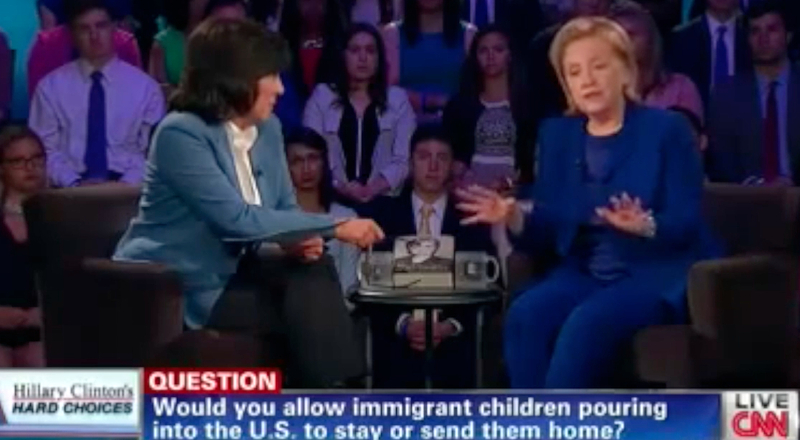 And just a reminder, there wasn’t much mention of Central American children escaping violence and poverty whom Clinton wants to deport without due process. This entry was posted in Elections, Sensible Immigration Reform, U.S. Capitol and tagged 2016, clinton, deportations, hillary, immigration. Bookmark the permalink.